THE reigning premiers will come into 2019 hoping to go back-to-back for the first time in the AFLW competition, having picked up a wealth of experienced players to join their side this year. But with the loss of last year’s Best and Fairest, Emma Kearney to North Melbourne and leading goalkicker, Brooke Lochland to injury for the majority of the season, their Bulldogs’ plans could be skewed. Last season: 1st – five wins, two losses. With a lot of experience lost in the off-season, the Bulldogs opted to do a straight swap in the draft, opting for more experience over youth. Paul Groves and his assistants would’ve followed the Victorian Football League (VFL) Women’s competition closely, picking up four players who had experience in that league. Classy midfielder, Eleanor Brown had the honour of adding TAC Cup Girls and Vic Metro experience to her VFLW experience last year, proving she has what it takes to shine at AFLW level. Brown can play an inside or outside role in the midfield and can roll across to the half-back line, which she did successfully in the AFL Women’s Under 18 Championships in July. Brown came up against a clever forward in Kate Bartlett during those championships, who she will now play alongside at the Dogs. Bartlett played for Western Australia as a 19 year-old last year, working hard to earn a chance to play AFLW alongside another ‘KB’ in Katie Brennan. The Bulldogs have one of the most attractive forward lines in the competition. This is of course headlined by Brennan, who is a class above with her marking and goal kicking ability. If she can stay injury and suspension free this season, she will be a key part in taking the Bulldogs to the top again. She will also have Kate Bartlett inside 50 to complement her. The Western Australian forward is also strong overhead and has a great goal sense under pressure, playing as a deep or high forward. 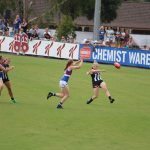 AFLW fans were starved of seeing Isabel Huntington reach her potential last season due to her heartbreaking Anterior Cruciate Ligament (ACL) injury. While she had another knee scare in the off-season, the 2016 number one draft pick will be ready to go in 2019, and she will certainly be one to watch with her prowess in the air and long kick. Add in the best on ground in the Grand Final, Monique Conti and the Bulldogs have a dangerous forward line that combines dominance in the air and speed on the field. The Bulldogs lost a key midfield duo in the off-season to North Melbourne, waving goodbye to Kearney and Jenna Bruton. While Aasta O’Connor mainly plays in defence, she was often a key cog in the ruck for the Bulldogs in seasons gone by, meaning she is another loss in the middle of the ground for the reigning premiers. The Bulldogs are fortunate that Ellie Blackburn has still stuck around, as she and Kearney combined to be a lethal duo last season. 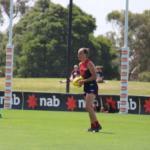 Blackburn has been elevated to the club’s co-captain alongside Brennan this season, allowing her to relish her on-field leadership as well as her obvious talent. Sandringham Dragons product, Brown could be the one to combine with Blackburn this season, as Blackburn’s great hands and precise kicks have given opposition midfields headaches in past years. Huntington’s debut game was cruelly halted in the first half when she ruptured her ACL against Brisbane, not even getting to complete a full game in her debut appearance for the side. Now having been cleared of another ACL rupture after an innocuous training incident, Huntington is on track to play her debut game for the Bulldogs in Round 1, and if last year’s glimpse is anything to go by, she will be a dominant force inside 50. Huntington’s overhead marking is elite and she is strong in the contests. Combine that with her long kick, and she is certainly one to keep an eye on. Ferres had a brilliant season in the VFLW for the Western Bulldogs, taking out the club’s Best and Fairest at the end of the season. Despite only playing seven matches, Ferres was named in the best in each game, averaging 17.4 disposals per game. This included finishing off her season with three consecutive games in which she racked up 20 disposals per game. Clearly, Ferres is one that knows how to find the football and is clever both by hand and by foot, which will make her a key cog in the Bulldogs’ 2019 midfield, given the loss of Bruton and Kearney. 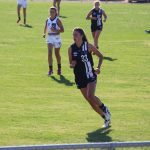 Brown was one of the most composed players in the TAC Cup Girls competition last year, winning the ball with ease in the midfield. She was often able to clear space with her long kick or create space with her outside running, making her one of Sandringham’s key players across the season. Brown was named in the TAC Cup Girls Team of the Year at half-forward for her efforts, highlighting her versatility across the field. 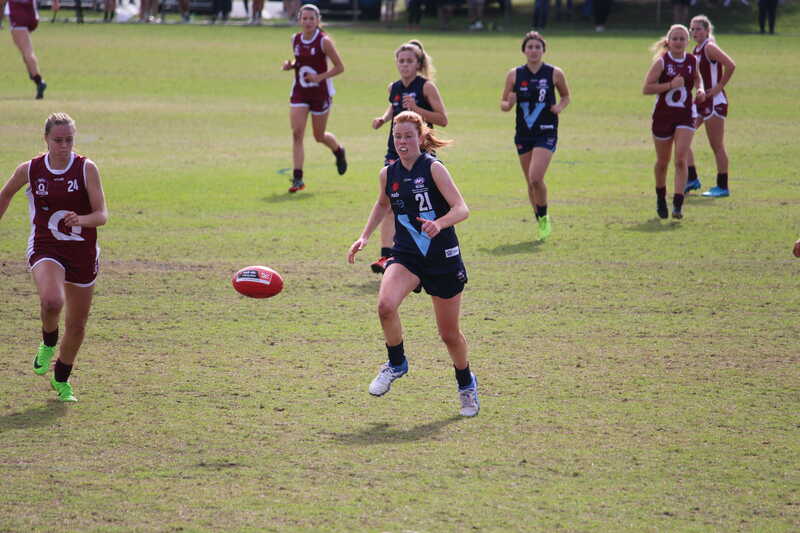 In the AFL Women’s Under 18 Championships, she found herself at half-back on the last day of the Gold Coast tournament, and was a key playmaker, racking up plenty of disposals and acting as an anchor across the back line. She made the Under-18 All-Australian team because of this game and her efforts across the tournament for Vic Metro. Despite some key losses in the off-season, the Bulldogs should still be the ones to watch when it comes to the premiership race. A forward line containing Brennan, Huntington, Conti and Bartlett, a defence containing the likes of Hannah Scott, Libby Birch and Lauren Spark and a midfield which consists of bona-fide stars in Blackburn, Brown and Ferres still makes the Bulldogs a highly talented team. Considering their success last season, they do have one of the harder draws in the 2019 season, facing off against Adelaide and the two new expansion teams in Geelong and North Melbourne, and hosting a Grand Final rematch against the Lions in the first four rounds of the season. If the Bulldogs can win at least two of those games, they will be well on track for another premiership berth, as they have an easy draw after that, facing off against Fremantle, Melbourne and Carlton in the last three rounds of the season. 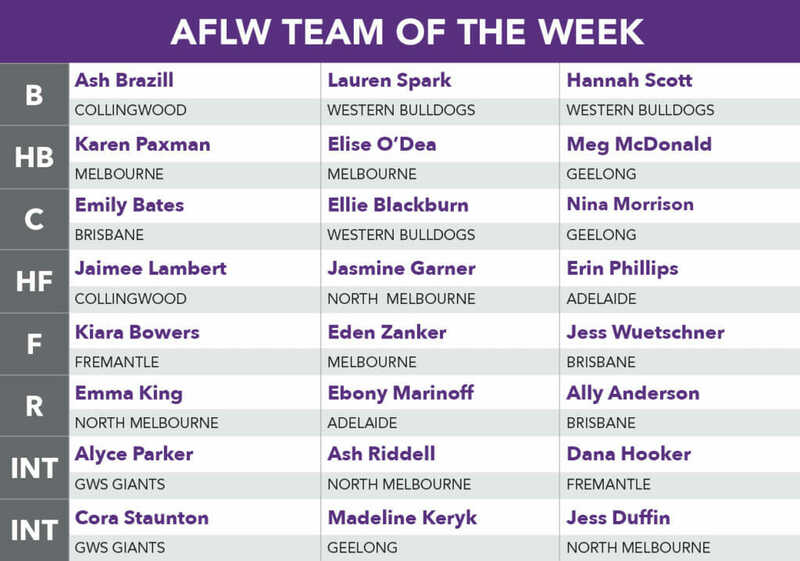 ROUND 15’s AFL Draft Central Victorian Football League (VFL) Women’s Team of the Week is dominated by the big winners of the weekend. 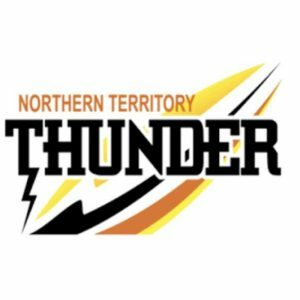 Firstly, there is Hawthorn who has five representatives, which is the most of any team, after its 25-point win over Northern Territory (NT) Thunder. Collingwood, Melbourne University and Williamstown also fared well with three players each in the best 22 after their impressive wins on the weekend. Essendon and the Southern Saints both have no players in the Team of the Week this round after both teams’ combined scores only added up to 13 in a bad weekend for the two proud clubs. Hawthorn’s Jayde Van Dyk has once again earned her spot in the team this week, collecting 15 disposals and showing great leadership in the back half. 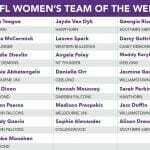 Tayla Thorn (NT) and Rebecca Dardengo (Williamstown) also make their debuts in the Team of the Week after breakout games. Emma Mackie was outstanding in the midfield for Hawthorn, kicking two goals to accompany her 24 disposals. She played a major role in Hawthorn’s win over the Thunder. Melbourne University’s Madison Prespakis and Seagull, Jess Duffin were at their usual best, with Prespakis gathering 25 touches and kicking a goal while Duffin racked up 28 disposals. The Hawthorn spearheads were on fire this week with Phoebe McWilliams kicking three goals and Sarah Perkins kicking two, which formed a formidable duo. Jasmine Garner was crucial for Williamstown in blustery conditions as she was able to kick two late goals to help beat Essendon at Windy hill. Defender, Gabriella Pound was a lock for the team this week after she was nearly best on ground in Carlton’s win over Darebin. At the other end of the ground, Sophie Alexander was superb for Collingwood, having a major influence on the game. She finished with 27 disposals in the Magpies’ win over the Saints. Her teammate, Stacey Livingstone was unlucky to miss out on a place in the best 22 this week, as she was deadly in front of goal. She kicked two goals from 11 disposals. Melbourne University pair, Kaitlyn Ashmore and Ashleigh Riddell are in the same boat, with Ashmore kicking two goals and Riddell dominating in the middle of the ground with 26 disposals. DAREBIN and Geelong headline the Victorian Football League (VFL) Women’s Team of the Week with three representatives each, after impressive wins on the weekend. On the other hand, Collingwood and the Western Bulldogs have one each after their losses in Round 14, while last-placed Essendon has no representatives after suffering a big defeat against the Cats. Every other team has two representatives in this week’s best 22. The backline is spearheaded once again by Jayde Van Dyk, who is a mainstay in the back six. Western Bulldogs defender, Lauren Spark, who held her own against the Hawks, accompanies Van Dyk in the key position stocks. NT’s Jenna McCormick managed to get her hands on the ball a lot, gathering 31 disposals in an impressive game across half-back. 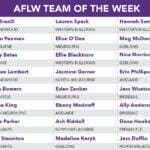 The midfield picked itself this week with NT captain, Angela Foley demanding her spot after a match-winning two goal and 29-disposal performance. Jess Duffin was also instrumental in Williamstown’s one-point win against Richmond with 30 touches and a goal. Vic Metro representative, Madison Prespakis dominated for Melbourne University, kicking a goal to go with her 28 disposals. Round 14 was the round of the spearhead forward in the Victorian Football League (VFL) Women’s competition with Hannah Mouncey, Kate Dixon and Sarah Perkins all prominent in their matches. 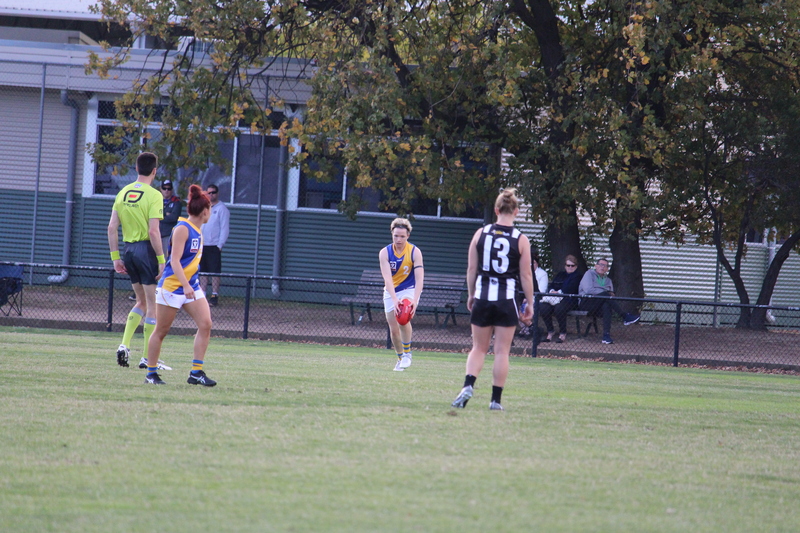 Hannah Mouncey has found herself in some form once again with two goals to go with her 16 disposals for Darebin. Richmond’s Kate Dixon also managed to kick two goals while Sarah Perkins kicked three majors in Hawthorn’s mauling of the Dogs. Melbourne University captain, Ashleigh Riddell can count herself as unlucky to miss out on a spot in the best 22 this week. She was a pivotal cog in the midfield with one goal from 18 touches. Geelong pair, Richelle Cranston and Mia-Rae Clifford are also extremely unlucky. Cranston was superb in the middle of the ground with 24 touches, while Clifford’s two goals from 13 touches were vital in the win. THE big day is finally here, where the Western Bulldogs and Brisbane Lions will face off in the AFLW Grand Final. However it has come with much controversy, as Bulldogs captain, Katie Brennan is set to miss the match through suspension. Despite this, the game will undoubtedly by a high-pressure, high-intensity hit-out with both clubs searching for their first AFLW premiership. The second season of AFLW comes to a close on Saturday afternoon as the top-of-the-table Western Bulldogs square off against last year’s runners-up in the Brisbane Lions for the ultimate prize. Despite finishing on top of the ladder, the Bulldogs will not host the game at VU Whitten Oval, with the contest being played at Ikon Park to accommodate a larger crowd. The Bulldogs come off an incredibly hard-fought win last week against Melbourne, thanks to late game heroics from Brooke Lochland earning them the right to host the grand final. They enter the game without their captain Katie Brennan, who will miss the game due to suspension, as a result of a dangerous tackle in the last quarter against Melbourne. Whilst this will be a big obstacle to overcome for the Dogs, Brennan did miss three rounds earlier in the season, and the Dogs still managed to win two of those three games. Their midfield will once again be key for victory and they will be hoping for a big contribution from Emma Kearney and Ellie Blackburn. With the Lions possessing a forward line which contains the likes of Sabrina Frederick- Traub and Jess Wuetschner, the Bulldogs defence will have their hands full. The game last week against Melbourne saw Lauren Spark announce herself on the scene, keeping Tegan Cunningham possession-less and limiting her impact on the game, and she will be significant once again on Saturday. Brisbane entered the final round in fifth place and were in desperate need of a number of results to go their way. The Lions took care of their own business, defeating the Giants by such a large margin that they surpassed Melbourne on percentage. 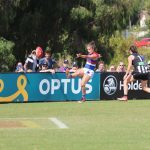 They were then assisted by their opponents on Saturday, with the Bulldogs defeating Melbourne and Collingwood defeating Adelaide. This provides them an opportunity for redemption, having lost the inaugural AFLW grand final to the Crows. Sabrina Frederick-Traub was unbelievable again last week and looked unstoppable in her four-goal effort to take the game away from the Giants, and she will no doubt look to do the same again. A key part of their success all year has been the play of Emily Bates through the midfield and she will be needed to counteract the star power that the Bulldogs possess. The stage is set for what should be a fantastic game. The Bulldogs look to complete an incredible turnaround from where they were 12 months ago, whilst the Lions look to bounce back from last year’s disappointing loss in the big game.